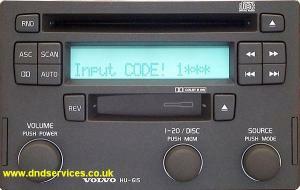 If the display continually shows "ERROR" then the unit may be codelocked and will need to be left switched on up for up to two hours to reset before another code entry attempt is possible. If it does not reset after this time, or the display shows "OFF" then all of your code entry attempts may have been used up, and the unit will need to be sent to us to be decoded and reset. Removal of the radio is fairly straightforward. To remove the Radio, depress the two vertical clips at the lower sides of the front fascia, this will then release the two handles. Pull the handles and the radio will come out. The leads can then be unplugged.
" INPUT MENU KNOB ! " " INPUT CODE ! 1*** "